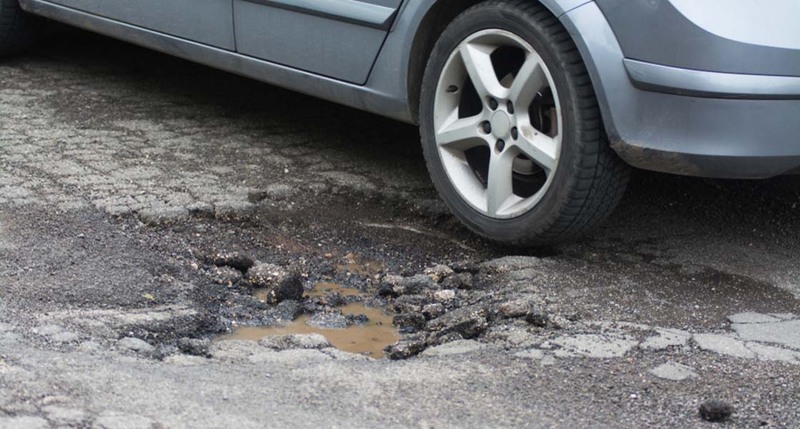 Tell us how the state should fix this pothole at our April event series. How would YOU fix Michigan’s roads? Every Michigander seemingly has an answer for this. Maybe you want lower weight limits on trucks, more durable road construction material, a different method for state funding, perhaps by instituting toll roads. Whatever you have to say, The Center for Michigan wants to hear it! REGISTER TODAY for one of three events this April during our Solutions Summit series, "Fixing Michigan's Road Mess." Michiganders are the ones who drive on our roads every day. It’s your commute. Your time. Your taxes. Your vehicle repair bills. Your voice should be heard during this roads debate. These free morning Summits will be hosted by the Center, in partnership with local organizations in Detroit, Lansing and Grand Rapids. You will have the opportunity to learn more about roads and how they’re funded from panels of experts and local leaders. Then Alexandra Schmidt, the Center for Michigan’s Public Engagement Director, will facilitate a guided audience session that will seek your input and questions. Your thoughts will then be included in the Center’s spring 2019 Citizen’s Agenda, a report that will be delivered directly to every House and Senate member in Lansing. In partnership with Crain’s Detroit Business, this Roads Solutions Summit will take place on the fifth floor of the Madison building near Comerica Park, located at 1555 Broadway St, Detroit, MI 48226. Public parking only, doors will open at 8:30 a.m. Tickets are complimentary, coffee and pastries will be provided. Crain’s senior reporter Chad Livengood will deliver the opening remarks, and Bridge Magazine’s Chastity Pratt Dawsey will moderate the panels. Speakers to be announced, stay tuned! Grab your ticket at Eventbrite. In partnership with Public Sector Consultants, this Road Solutions Summit will take place in the Governor’s Room at the Lansing Center, 333 E Michigan Ave, Lansing, MI 48933. Paid parking is available onsite. Doors will open at 8:30 a.m. Attendance is free, coffee and pastries will be provided. In partnership with the Grand Rapids Chamber of Commerce, this Roads Solutions Summit will take place at the Chamber’s office, 250 Monroe Ave NW suite 150, Grand Rapids, MI 49503. Public parking only, doors will open at 8:30 a.m. This is a free event, coffee and pastries will be provided. This is the 8th statewide public engagement campaign hosted by The Center for Michigan. The Center is a nonpartisan nonprofit which works to engage with at least 5,000 residents every year to identify resident priorities for the state legislature and amplify those views to state leaders. Over 50,000 Michigan residents have taken part in the Center’s campaigns. Resident voices in past campaigns have convinced the legislature to, for example, increase funding for pre-K education, cut corrections spending, invest more deeply in Pure Michigan, and more. Bridge Michigan is a journalism project of the Center for Michigan. How about opening the rainy day fund? What better way to fix the damn roads! I lean toward higher tax on gas/diesel, along with making sure ALL those funds go directly to road maintenance. Nobody likes higher taxes but the money just isn't there otherwise. People can scream about government waste all they want, though the reality is that they can't cut enough spending to fix roads without serious detriment to other government functions/services. I don't agree with a sales tax increase, in that it's too regressive. Those who don't own vehicles or who drive very little should not be punished with higher sales taxes on everything they buy. Not sure how to feel about toll roads and wonder if they actually pay for themselves. comments to see hopefully better ideas. Is a sales tax "regressive"? In two words, "who cares?" It is not the political establishment's problem to coddle any group. It doesn't matter what anybody does, there will always be some that have more and others that have less. And the concept that we should elect "somebody" to "do something about it" is about the most foolish thing anybody can do. You know that since we as a society have determined that cigarette smoking is evil, we don't hear or see any large levels of complaints about the taxation of cigarettes. In fact, most seem to endorse it. Don't bother with the shifting and diversion but a substantial increase in fuel taxes with the stipulation that it be used for structure and no pander would make sense. As long as we also send that insane and stupid CAFE legislation to the garbage heap too. In so many ways, CAFE is the purest form of that evil "regressive" taxation. Because the truth is, it only benefits the politicians. Not us and it never will. Just raise fuel taxes on the national level and proportionally return it to states with the direction that it be used for structure. But the truth is, we don't have any inventive of courageous political representation these days. They all worry about "the party" or what sort of crap the twits in the press will write. The nation is secondary and not even on the radar anymore. (1) inclusion of priorities into Smart State plan for implementation in Regional Planning Agency areas (which set annual priorities for Federal transportation, land use and services funding) and local community college areas (Digital Economy areas of US Department of Commerce), and agendas for annual calendars of counties, cities and townships. (2) Partnership with U Michigan, MSU infrastructure research and Extension services to assist in Smart State public engagement forum outreach, management (including keypad polling tools) and archiving and adoption of Smart and Connected Communities frameworks for each Digital Economy area, including as framework for planning 5G Mobility Infrastructure for Vehicles, and for Transforming local government performance through cooperation and consolidation agreements. (2) Integrating Transportation and Mobility civic engagement process with Watershed Management and Resiliency planning of regional planning agencies and Great Lakes natural resources and Great Lakes Smart State partnerships. From recommendations of Internet Public Trust, including recommendations for Smart Berrien County and SW Michigan, and work with Illinois Smart State and Connected Communities civic engagement and Big Data initiatives. The well to do in Michigan depend upon the labors of multitudes of lower income workers. The best and most socially equitable formula for generating additional funds for road improvements is to increase the income taxes for those of higher income levels and reduce the burden for lose who must often travel many miles to work for the"man". This has proven to absolutely not destroy the incentives for business and to provide an attractive cause to remain in Michigan for those who labor. Yes that way the "Rich"' will have nice roads to move from Michigan with its non deductible state income tax to FL TX or others with no state income tax at all. Actually it appears as though Florida does have a 13.4 cents per gallon gas tax. If the Rich don't want to pay their share they can leave. Vs. Michigan at @26? But great idea, maybe we can just kick them out? We are not provide sufficient information to offer informed suggestions or ideas to improve out roads. What criteria are used to judge our roads? In my town the roughest riding half mile of road [one that is consistently mentioned when talk is about roads] is due to the poor quality of road repairs, such as sealing cracks [not pot holes], where the repairs create a washboard affect. What are the causes of that a creating the unacceptable conditions of the roads? What are the new technologies available for road construction and what are they suppose to deliver? What are the performance expectation of our current roads and what would be necessary to do to improve or extend those expectations? Just drove to Niagara Falls through Canada and their roads were nice. Similar weather to Mi. the roads seemed better. A century ago, Detroit became a city of over one million utilizing Annexation. 100 years later, Detroit 2.0 can do it again. Michigan has over 180 communities in economic distress, many in SE MI. Annexation with its benefit of increased federal revenue sharing for cities of over one million, is one way of reversing the donor state status of MI. Increased revenue can then be added to other components of a comprehensive funding solution for infrastructure improvements. The same possibility exists for the Grand Rapids SMSA with over one million in population. Successful models exist; Charlotte-Mecklinburg and Texas to name two. Detroit has already proven regional approaches to governance can work; The Water Authority and the Convention Center. Working together could make this possible by 2020. Our loss of population over the last decade serves as a catalyst to leverage current numbers by Annexation, to maximize our value. I think holding these summits is a great idea and I commend Center for Michigan for doing this. There is a big disconnect between solving real problems, like the condition of the roads and what elected officials are willing to do to solve the problem. We need that upward pressure from the grassroots to give political cover for our elected officials to make, what they perceive as tough votes. Michigan has the highest auto insurance in the nation. Fix that and we'll save hundreds of dollars annually. Charge each driver an annual fee equal to about 50% of the savings. Citizens end up paying significantly less each year while lawyers and the medical industry get less and roads get better. Why can't you just raise the sales tax a penny or two and call it good? I am unable to attend a meeting. Glad to see that all of the meetings are being held to guarantee that the meeting will get more than its share of representation. The rest of us get to drive from 200 to 700 miles to be heard. Business as usual in Lansing. Easy fix to the road funding is to make the legislature restore ALL of the funding over the last 50 years that they have diverted to fund all of the other programs that they didn't have funding for. I'm tired of the lies that flow like a river from these elected officials. No more taxes and let the people who caused the problem , fix it. Attended the Detroit meeting. Thought the public comment period should be longer and maybe at the beginning so all the panel “guests” would stay and listen to the people of Michigan. All the solutions seem to be oriented to sticking the taxpayers and no mention of the business community responsibility. With the last eight years of shifting the burden to working stiffs, it’s time our government look out for wage earners. We just have been told our outrageous auto insurance will raise fees $220 on every vehicle in Michigan. Pensioners get their pensions taxed now and the wealthy and business just got a huge federal taxcut which could of been spent on infrastructure spending including roads in Michigan. So at your next townhall include the responsibility of those who can afford to pay more I.E. business. They can afford to hire lobbyists/media to stick us with the bill but maybe, just maybe the disenfranchised will get a break for once. Tax cigarettes & alchohol (both abused highly in this state) and the new marijuana stuffs more. Start fining bars, bar tenders and their owners. Plus, start fining and ticking stadium goers leaving stone drunk to drive home. Also, where the Sam hill is the money from the lottery, that's supposed to be go to schools? An audit needs to be done on that. Start fining and ticketing people more heavily, driving using their cell phones.